I own many different power saws and other carpentry tools. Do you think I can achieve nearly professional results as I try to install the hardwood flooring? DEAR BOB: Since I don't know the level of your carpentry skills, I am going to say maybe. The traditional hardwood floor installation process is not that difficult, but the many different tricks and tips are what separate professional installers from those who aspire to have their years of accumulated knowledge. CLICK HERE to get FREE & FAST BIDS from local hardwood flooring contractors. Your collection of saws and other carpentry tools will come in handy, but realize that professional hardwood flooring installers come to the job with an arsenal of assorted hand and power tools. They have special nailing machines, some pneumatically powered, that drive special barbed nails at the precise angle and depth through the tongue of each strip of hardwood flooring. You can hand nail hardwood flooring, but I'm sure you'll make a mistake or two, and your results will be less than professional. The special nail guns can be rented. You may also need a router equipped with a special bit. 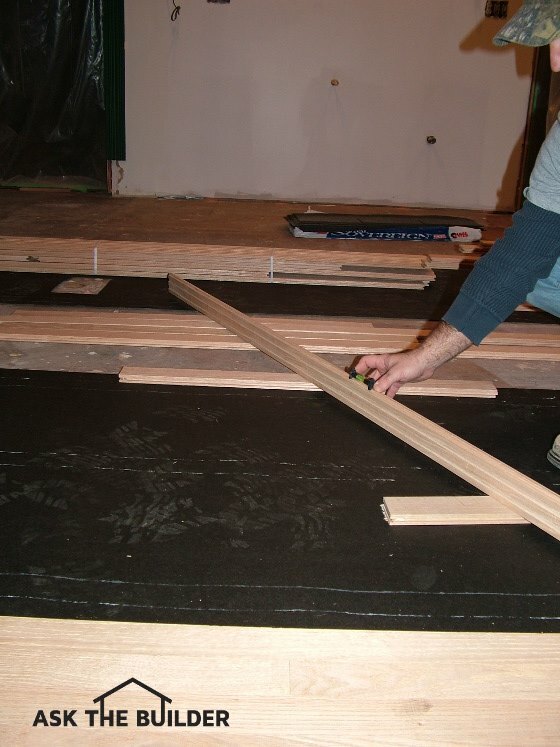 It is not uncommon for a professional to rip a piece of hardwood flooring to make it fit against an existing piece. To make the hardwood flooring pieces interlock, a new groove has to be created on the cut edge of hardwood. The first thing you need to do before you start the job is get the hardwood flooring into your home and let it acclimate to the indoor humidity and temperature. Although this acclimation period can be achieved in three or four days, I recommend you bring the hardwood flooring into your home for a minimum of two weeks for the best results. Put the wood into the actual room where it will be installed if at all possible. Be sure that room is at the temperature it will be at once the room is finished. The longer you let the wood acclimate, the tighter the joints will be as it is installed, and, more importantly, after the hardwood is finished. Hardwood flooring is a hygroscopic material, and it changes shape and size with changes in temperature and humidity. The subfloor to which the hardwood flooring is attached should be clean, dust-free and securely attached to the floor joists. Now is the time to attack any pesky floor squeaks. Most floor squeaks can be traced to loose sub-flooring that moves up and down as it's walked upon. The movement of the wood along the nail shafts creates the squeak. Screw down the existing subfloor to the floor joists, especially in areas of the floor where you will walk once the hardwood is installed. Those areas covered with furniture may not be as important, but I would suggest you screw down the entire subfloor to the joists. Watch this video to see how to eliminate most floor squeaks. Use a long metal straightedge to locate humps and low spots in the floor. The low spots should be filled in with floor leveling compound or better yet, asphalt shingles. Here's a precision straightedge. Don't get a cheap one. You'll regret it. CLICK HERE TO HAVE IT DELIVERED TO YOUR HOME FAST. A flashlight really helps here. If you shine the light at a low angle or put the flashlight on the floor aimed at the straightedge you can see where light leaks under the tool. If the low spots are very subtle, multiple layers of asphalt-saturated felt paper will work well. The entire subfloor should have a minimum of one layer of asphalt-saturated felt paper over it to protect the underside of the new hardwood flooring from water vapor that may try to work its way through the subfloor. The felt paper also helps keep the new hardwood floor quiet. Whenever possible, the new hardwood flooring strips should be installed perpendicular to the run of the floor joists. For a creative look, you can run the new hardwood flooring diagonally across the floor joists. Running the flooring diagonally is more work, and will require slightly more material. Be sure to install the strips of hardwood flooring in a random manner. Regular hardwood strip flooring has tongue and grooves on all four edges. This means you don't have to worry about having a seam where two pieces of flooring meet break in the center of a floor joist below. Don't try to get fancy with respect to how the different pieces look. The bundles of hardwood flooring come mixed with all sorts of long, short and medium lengths. The more random the pieces are installed, the better the finished hardwood floor will look. Whatever you cut off one piece up against a wall, the leftover piece is used to start the next row. There's usually very little waste wood flooring because of this clever trick. A rubber mallet is used by professionals to pound the new strips of flooring into place against the flooring already nailed to the floor. Each strip of new flooring needs to be tight along the long edge and the short edge where it butts against the piece next to it. 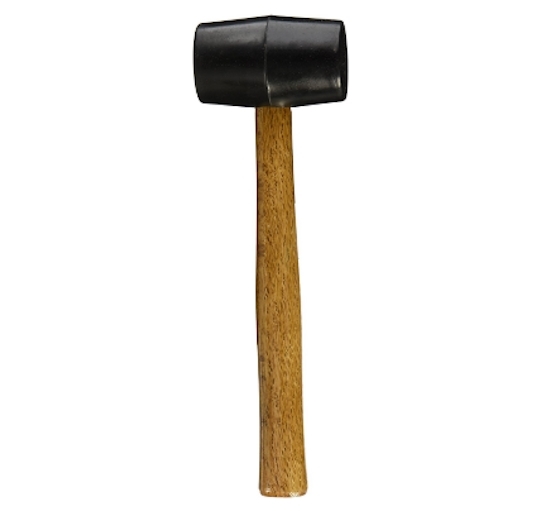 This is a standard rubber mallet. Nothing fancy here. CLICK THE IMAGE NOW TO HAVE IT DELIVERED TO YOUR HOUSE. You'll notice that the tongue and groove feature of each piece of hardwood flooring not only is along the long edges, but also on the short stubby ends of each strip. One of the most secret tips is reversing the direction of the tongues and grooves. Professional installers don't always start laying a floor on one wall and work to the far wall. They may start in the middle of the room for any number of reasons. When this happens, a special strip of wood that is the thickness of the tongue but twice as wide, is installed into the groove of the flooring. This strip of wood allows the installer to start laying hardwood flooring going the opposite direction so the tongues of the strips are always exposed. 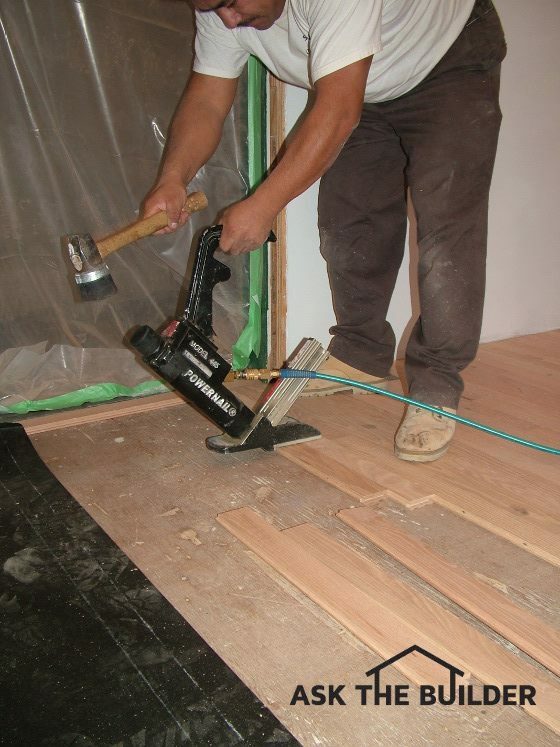 The tongues of each strip of hardwood flooring must be exposed so you can nail the hardwood flooring to the subfloor. Follow-up to your instruction regarding random installation; you shouldn't put pieces of the same length end to end or next to each other to avoid a mosaic look, right? In other words, you shouldn't install a medium size board (around 26-30 inches) followed by another medium size board. And then in the next row, put adjacent more medium sized boards (as opposed to mixing it up with long, med, and short). I am buying a new construction home from a very large builder. I would like to ask you should I opt for hardwood and ceramic flooring at the time of building this house through the builder or should I contract to install after closing to save money and tax on total purchase price? Builder is charging appx. $15k-17k for the flooring for A grade. B/C cost even more. You just have to price it out. I can't tell you Yes or No...... Too many variables. have you had any experience with home depot's home decorators' bamboo flooring, the strand woven distressed dark honey in engineered click or hardwood solid? I want to install wide planked engineered hardwood flooring in a coastal area, not on but near the water. Should I be concerned about warping with a 8 3/4, 7 or 5 in. product? The flooring will be on the 3rd level of the home about 1,200 square feet living area. My concerns are minimal. I'm just concerned that the installer will follow the written installation instructions put out by the wood flooring manufacturer. Also, read all my hardwood columns where I mention "acclimate".